Monday there was no school because it was Dr. Martin Luther King’s Birthday. Martin Luther King changed the world and made it possible for all of us to have the opportunities that we have today so I forever appreciate him and thank him. Usually I’m not able to make The Hoop Hall Classic Monday games but because of the holiday I was able to attend the high school games with my teammates and coaches. We got the chance to see a lot of the top high school programs in the country play like Findlay Prep, Montverde Academy, Curie High School, and more. I think Cliff Alexander was the most exciting player of the tournament he was a BEAST. He’ll be a Kansas Jayhawk in college so definitely look out for him. Hopefully you guys will watch me play in The Hoop Hall Classic next year because the high school I’m attending will be in that event next year. After the tournament we left to head home. Tuesday was a regular back to school day. While at school we got hit with another snowstorm, which led to my evening basketball workout getting canceled because the roads were terrible and they canceled school on Wednesday because of the bad whether so Tuesday and Wednesday ended up turning into vacation days lol. Thursday night we had practice but it was cut an hour short because there was a gym conflict with the fire department basketball team and us. We should of just scrimmaged them just to stay in the gym, they probably couldn’t keep up anyway lol. Friday night my friends and I went to a party around my way, which was cool. I didn’t get home till 1:00. We had practice the next day so I had to get ready for that. Saturday and Sunday my team practiced, were getting ready for that Clash Of The Cup Tournament on February 8th – 9th and it’s a must win. We also found out that we are headed to Portland Oregon instead of the M.I.T. for The Nike Gymrats Presidents Day Tournament, which should a good. Flying all the way across the country to play against west coast talent is different but a great experience for us. We went to Utah last year and took the X-Factor Invitational Tournament championship and I hope we’ll have the same results in Portland. West coast teams love to shoot the 3 ball as mush as possible, that’s very different from east coast ball plus they play at a slower pace. 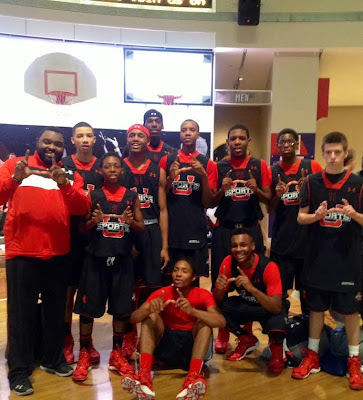 Team Izod Sports-U is the best basketball program and experience I ever had. They care about us over here and it’s not just about basketball its education, teaching us how to be young men, etiquette on and off the floor, community service, and more. The experiences and opportunities they give us is more than appreciate and we are a family not just a team.